The Colosseum, is an elliptical amphitheatre in the center of the city of Rome, the largest ever built during the Roman Empire. It is considered one of the greatest works of Roman architecture and Roman engineering in history. Occupying a site just east of the Roman Forum, its construction started in 72 AD under the emperor Vespasian and was completed in 80 AD under Titus. Capable of seating 65,000 spectators, it was used for gladiatorial contests and public spectacles such as mock sea battles, animal hunts, executions, re-enactments of famous battles, and dramas based on Classical mythology. The building ceased to be used for entertainment in the early medieval era. It is one of Rome's most popular tourist attractions and still has close connections with the Roman Catholic Church, as each Good Friday the Pope leads a torch lit "Way of the Cross" procession that starts in the area around the Colosseum. 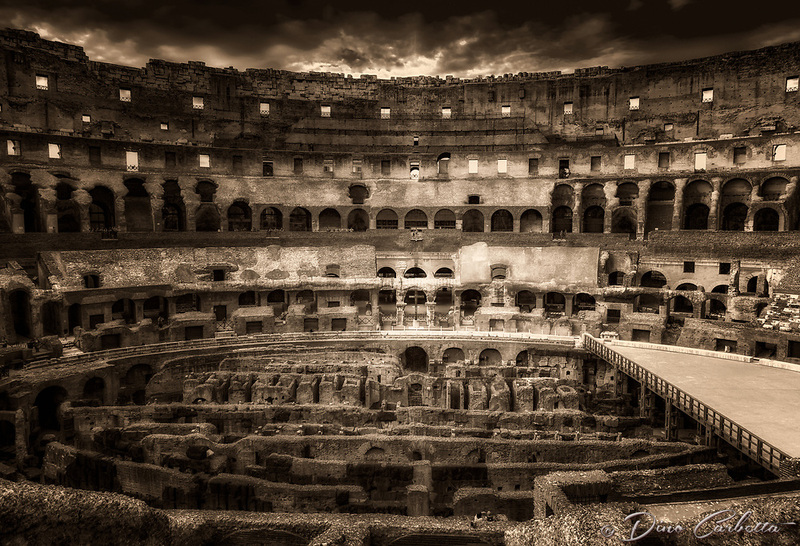 The Colosseum is generally regarded by Christians as a site of the martyrdom of large numbers of believers during the persecution of Christians in the Roman Empire, as evidenced by Church history and tradition. A Cross stands exultant in the Colosseum center with a plaque stating: “The amphitheatre, one consecrated to triumphs, entertainments, and the impious worship of pagan gods, is now dedicated to the sufferings of the martyrs purified from impious superstitions.” In viewing many historical sites during my journey in Italy, seeing the iconic Colosseum for the first time…I became awestruck. It is as grand in person as it appears in the media, and it seems to hold a very mystical aura. Climbing the ancient steps inside, one cannot help but feel not only the suffering of its past, but the forgiveness and sacrifice of its present stature.